Peyton Manning isn't popular just because he was on pace to smash every meaningful NFL passing record before his career-threatening neck injury. Fans like him because of the look-at-how-goofy-I-am sense of humor he displays in commercials hawking everything from credit cards to cell phones. Cam Newton is the frontrunner for rookie of the year due to his strong arm and able legs, but his Superman celebration and knowing smile help make the case that he is destined to be a superstar in the NFL. It's refreshing, then, when someone serious comes along and refuses to partake in the ritual. This is one reason Denver Broncos quarterback Tim Tebow is fascinating to die-hard football fans and casual viewers alike, despite his questionable skills as a professional quarterback. Why Do NFL Fans Love Backup Quarterbacks So Much? In less than two NFL seasons Tebow has gone from shaky pro prospect to emerging cult hero. The primary reason for this is that he plays the quarterback position in an unusual manner. Football fans are accustomed to a certain level of redundancy—Aaron Rodgers is on track to have one of the greatest seasons ever played by a quarterback, but he is essentially rehashing what Dan Marino, Peyton Manning, and Tom Brady did during their own record-breaking seasons. This conventional style of quarterbacking is predicated on accurate downfield passing and efficient decision-making—Rodgers has completed nearly 72 percent of his pass attempts this season and only thrown four interceptions. And even though Rodgers is more athletic than the average NFL quarterback, like Manning and Brady he prioritizes getting the ball into the hands of his receivers and only runs when that is not an option. Tebow, on the other hand, has used a run-first, pass-second strategy, something analysts have long crowed would never be possible. We may never see another quarterback who, in a pass-first league, can lead his team to victory while only attempting eight passes—which makes his games must-see television. But the more interesting factor, the reason Tebow is more than just a passing fad based on new player formation, is his personality. Tebow is a serious young man in a silly adult world. He is an irony-free individual who seems uninterested in developing an athletic persona based upon rehearsed machismo or wink-wink self awareness. He's content to be himself and to give answers that are more straightforward than his downfield passes. To quote Grantland's Jay Caspian Kang, Tebow "eyes up the zeitgeist, smiles, and says a prayer for its soul." To put that quote into perspective, Aaron Rodgers recognizes that same zeitgeist, accepts its logic, and then tries to figure out which camera he should wink at. That's not to say Tebow is without distinct personality traits. On the contrary, he is as well-known for his outspoken religious beliefs and for the ways that he adamantly displays those beliefs, whether it be via Bible verses inscribed in eye paint or in thanking his "lord and savior Jesus Christ" at the beginning of interviews, as he is for his play on the field. Tebow's refusal to tone down his religious fervor partially accounts for why he continues to command so much attention. It's possible to make the argument that Tebow is just another celebrity athlete who is simply choosing to sell people on the good book rather than a certain brand of sneakers. But his method of presentation makes him vastly different from his counterparts. The degree of sincerity Tebow displays while presenting himself to the public is what makes him distinct. When Tebow scores a touchdown—something he does much more frequently than most NFL quarterbacks—he doesn't partake in some celebration that entails showing the world he's Superman or pretending to don a championship belt. He either reacts with workmanlike satisfaction or unbridled joy. These types of celebrations are uncommon in the professional ranks but rampant on the fields of pee-wee football, where the young competitors are unaware of the people watching them but very much engrossed in the joy of competition. Tebow's pre-game/post-game ritual doesn't involve gathering his teammates in a huddle and screaming a bunch of nonsense, a routine that purports to get players' competitive juices flowing but always seems like it's designed to show off to the cameras on the playing field. 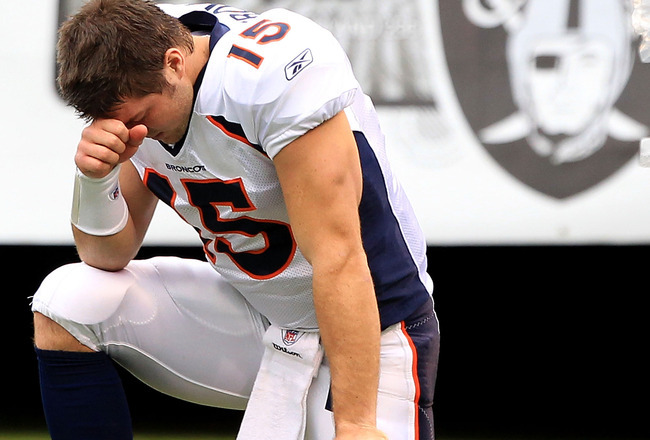 Before he takes the field, Tebow simply kneels. Kneeling is sign of humility, and while the gesture does make him stand out on NFL sidelines, the fact that it's consistent with his humble personality makes it seem real rather than a ploy for attention. Consider the interview Tebow gave to the NFL Network's game crew following the Broncos' victory over the New York Jets, a game in which he failed to record a single touchdown pass. When asked how it felt to know that, despite the criticism from myriad corners across the NFL, Broncos fans and his teammates believed him, Tebow responded: "It makes me feel really good. You want people to believe in you; you want people to care about you, and that makes me feel good." That response is refreshing because it communicates a level of sincerity most professional athletes seem too insecure to display. I've listened to hundreds of interviews with athletes and usually when an interviewer asks an athlete whether he cares about what fans think, that athlete gives a stock response along the lines of "I don't care what fans think." Certain athletes even seem to court animosity from the spectators that enable their careers. Perhaps they hope their antagonism will only make them seem tougher and thus more marketable. Smart fans can see right through this routine. It's a tired act, and one Tebow refuses to partake in. Perhaps it is because Tebow is as physically tough as any quarterback in the game and unafraid to put his shoulder down and challenge All-Pro defensive backs that he doesn't feel the need to fake a level of indifference and hope that it will make him seem more macho than he actually is. This is what makes Tebow so appealing. He's unafraid to be vulnerable and serious in a world so full of jokes that it's often hard to discern the punch line from the set-up. And his serious approach to football makes it easier for fans to listen when he talks about the other things he cares about, such as being a good role model or building hospitals in the Philippines. Cultural critic Lee Siegel's recent book Are You Serious: How to Be True and Get Real in the Age of Silly explores the fact that irony and self-referential humor have saturated modern culture to such a degree that many people are now unable to discern who is serious and who is joking. Siegel's book identifies serious people as those who pursue a calling rather than a career and go about their work with attention, purpose, and continuity. When I look at Tim Tebow I see someone who has both a career, playing professional football, and a calling, living a life consistent with his religious beliefs. He pursues both with Siegel's three pillars of modern seriousness. Casual fans may not be able to articulate this, but Tebow's workmanlike approach is what makes him so unique and so appealing to fans tired of the same pre-planned and machismo-infused routines that dominate professional sports. If you disagree with Tebow's religious views or think he has no future as an NFL quarterback, then feel free to express that opinion. But like Tebow, try to do it a serious manner. I imagine your argument will get more traction.